House MD Episode Guide: Season 3 #302 "Cane and Able"
Third Season Episodes :: #302 "Cane and Able"
so after reading the ones below, click on the "Search" button above to search for "302". This page is not complete and has not been checked for accuracy. We will be adding more information - suggestions, corrections, etc. are welcome. by aliens in the HOUSE episode "Cane and Able"
airing Tuesday, Sept. 12 (8:00-9:00 PM ET/PT) on FOX. A boy, who thinks he has been and will again be abducted by aliens and who has some strange symptoms that have the team wondering just what could be behind them. House thinks the kid is having nightmares with the one symptom of having a bleeding disorder. But the tests on the bleeding disorder are first negative and then positive and both Chase and Foreman think the other screwed up. But the tests keep going back and forth. Cuddy and Wilson and later Cameron all keep from House the fact that he solved the last case. Cameron takes a clinic patient who turns out to be House's last patient, now incredibly better. House (Hugh Laurie) treats a boy who believes he is being abducted by aliens in the HOUSE episode "Cane and Able" airing Tuesday, Sept. 12 (8:00-9:00 PM ET/PT) on FOX. Also pictured: Skyler Gisondo. House's pain returns and he turns back to Vicodin. At the end he takes out his cane. We learn Chase is open to the idea of UFOs. Although the wings melting reference is really common, these days some younger people aren't exposed to Greek Mythology even the story of Daedalus and his son, Icarus, who built wings which they attached to their arms with wax. But Icarus flew too high and close to the sun and his wings melted and he fell to his death. Information about the t-shirt House was planning to run in. And Analysis of the medicine in the episode from "Polite Dissent". Information on the Health Issues/Diseases mentioned in the Episode. Chase, after Cameron suggests that the boy has been sexually abused and Foreman says there is no evidence of that: "I think we should talk to the kid." House: "Why? In case he's telling the truth?" [Chase shrugs] "You're a believer, aren't you?" Chase: "I'm just not arrogant enough to think that of the 50 billion galaxies, hundred billion stars per galaxy and ten million, billion planets in the universe, that we're the only ones with life." House: "No, but I'm guessing we're the only ones who like shoving things through our back doors." Cameron in the Clinic: "I have time for one more." Nurse Brenda: "Don't blame you for spending extra time down here. Heard the artist formerly known as gimp is back upstairs." Cuddy: "He was reckless with a patient." Cuddy: "But he didn't know that. He needs at least some glimmer of humility." Cameron: "Why does he need that, because other people have that? Why does he need to be like other people?" Cuddy: "He needs to be less reckless." Cameron: "Well, you did it. He's dismissing symptoms, looking for easy solutions. He's in pain." Cameron: "Why?" [Cuddy looks down and away.] "You know this is affecting him, don't you? Cuddy, to Cameron who has turned to go and tell House: "Telling him that he got his last case right, won't do anything to help him." Cameron: "It will make him less depressed." Cuddy: "Which might not help his leg." Cameron: "But you don't know." Cuddy: "We need another plan." Wilson: "Don't talk about it that way." Wilson: "'Plan.' It sounds like we are conspiring against him." Cameron: "I'm going to tell him." Cameron: "Then come up with a cunning plan and fast." Cuddy to Wilson after Cameron has stormed off: "She's not nearly as delightful as she thinks she is." Cuddy going after House who is headed home: "You just giving up on this kid?" House: "You have to know when to stop." Cuddy: "You don't stop. You never stop. You just keep going until you come up with something so insane that its usually right." House: "Except on my last case." Cuddy: "Don't be pathetic. Forget the last case. This kid obviously has something wrong with him." 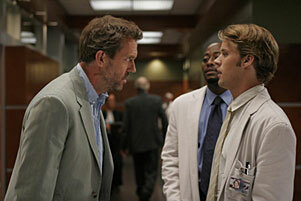 House: "When did you develop such strong opinions about my patients? Last week you were convinced my patient wasn't sick. Now you're convinced this one is." 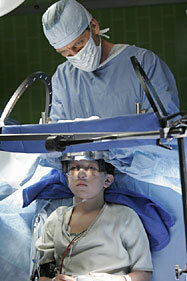 Cuddy: "This one is a young boy. His parents are desperate. Just get together with your team, spend a few extra hours—"
House: "Well, I guess we could amputate his left leg. It's where we found most of it. Maybe we should just remove his affected eye completely. Cuddy: "If you have reason to believe that might help—"
House: "I'm not going to start lopping off body parts. But its interesting that you give me the green light." Cuddy: "I just want you to do something." House: "You've been overly supportive this entire week. Either your hormonal or your guilt-ridden. And its too early in the pregnancy for this to be hormonal." House: "What did you do wrong?" Cuddy, referring to House's last patient: "He had Addison's. Your last patient. You were right. I gave him one shot of cortisol and he woke up like Rip Van Winkle." House: "You believe what Cuddy tried to pull? " House: "She lied to me. She cured my patient with my diagnosis then lied to me about it." Wilson: "That doesn't sound like her." House: "You're right. Does sound like you, though." Wilson: "What exactly did Cuddy tell you?" House: "Nothing that your body language isn't telling me right now. So, what was the plan? I'd feel so humbled by missing a case that I'd re-evaluate my entire life question the nature of truth and goodness and become Cameron?" Wilson: "Something like that. More that if we told you the truth that you'd solved a case based on absolutely no medical proof, you'd think you were God. And I was worried your wings would melt."